While I normally write and comment on fisheries issues, it would be naif to deny that in the Pacific, foreign aid and commercial fishing are closely linked, even if they are not always formally linked. How did foreign aid to the Pacific fare in the last decade? ODA to Pacific island countries increased in the last decade by approximately one-third after a long period of relative stability, despite significant year-to-year variations (Figure 1). The increase in ODA coincided with high-level calls to ‘scale up’ aid to developing countries, discussed above, and with two major military interventions in the region. Although significant, the increase in ODA to Pacific nations is modest when compared to the increase in ODA to sub-Saharan Africa, or indeed, to developing countries as a whole. Figure 2 illustrates the relative increase in ODA enjoyed by different regions since 1970. 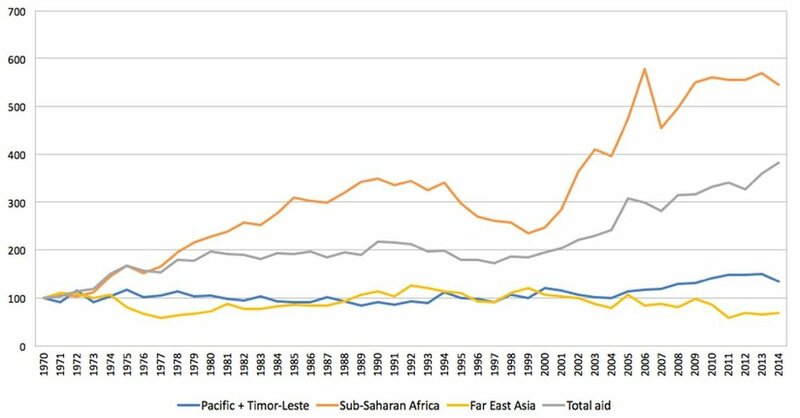 While aid to Pacific nations has remained relatively stable in real terms since 1970, increasing moderately in the last decade, it has increased more than six-fold in sub-Saharan Africa over the same period, and almost three-fold in other developing countries. ODA has remained stable, and more recently fallen, in Far East Asia owing to the strong economic growth enjoyed in that region. The divergence between regions is especially notable after 2000, or in the period of the scale-up. Whereas ODA to the Pacific increased by one-third since 2000, across all developing countries it doubled, and in sub-Saharan Africa, the increase was higher still, with ODA in 2014 230 percent what it was in 2000. Changes in the allocation of foreign aid across Pacific island countries have not been linked to per capita income, or arguably by association, poverty reduction efforts. Countries with comparatively high per capita incomes such as Cook Islands, Niue, and Tonga have seen large increases in aid over the period of 2000-02 and 2012-14 (119, 93, and 116 percent respectively), whereas aid to the two Pacific island countries where poverty is concentrated, Papua New Guinea and Timor-Leste, grew 19 percent and fell 36 percent, respectively. The largest increase between over this period, interestingly, has been in ODA directed to regional initiatives and organisations. This now represents the third largest component of ODA to the Pacific. When aid per capita is considered, its unequal distribution between Pacific island countries is even more evident. Aid per capita is particularly low in Papua New Guinea and Timor-Leste (the two poorest countries in our sample), and has decreased in real terms since 2000-02 in both countries. Indeed, Figure 3 shows that aid per capita received by Timor-Leste, Fiji and Papua New Guinea sits close to the (unweighted) average for Far East Asia – far below that of the Pacific. Where does this aid come from? While much depends on how aid is measured, it is clear that Australia is the largest provider of development assistance in the region – though there is significant variation between Pacific island countries, with those in the North Pacific more reliant on Compact Funding from the United States (see Figure 4). Aid to the Pacific is also very concentrated. In no other region in the world does a single donor provide such a large share of total ODA as Australia (the United States in the Middle East comes close). The situation has not changed in light of the recent cuts to the Australian aid budget, with aid to Pacific island countries largely protected from reductions (although aid from Australia has declined in real terms). Chinese aid is often highlighted as significant in the region (frequently as a cause for alarm, though we take a different view). Exaggeration of its importance is compounded by the fact that data for Chinese development assistance is poor, and not included in OECD figures (or in Figure 4). In our paper, we draw on an extensive Lowy Institute survey of Chinese assistance to Pacific island countries, based on information sourced from budget documents and other government sources, to compare China’s aid with that of OECD donors. 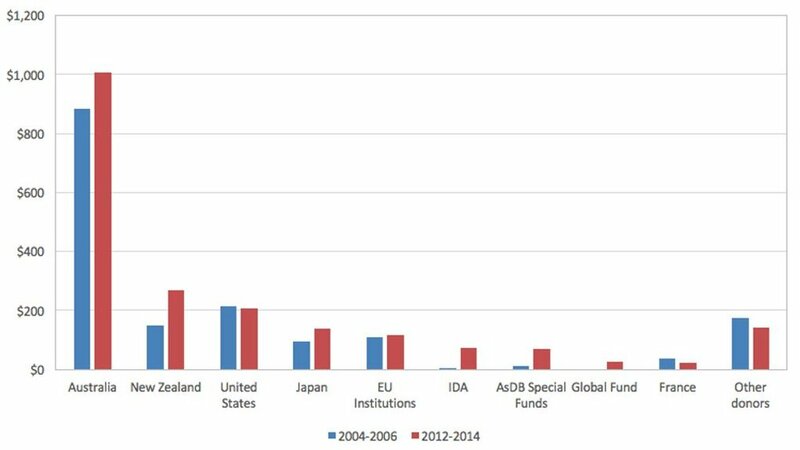 These estimates are compared to OECD data for other donors in Figure 5 over the 2006-14 period (multi-year data are more reliable given challenges associated with calculating yearly expenditure of Chinese ODA-funded projects). What the comparison suggests is that China has become the third most important source of ODA to the region, with a total of US$1.78 billion provided as development assistance between 2006 and 2016. This indicates that, while certainly significant, China remains a long way from becoming the most important donor to the region (despite common statements to this effect). Having said that, China is an especially important donor in a handful of countries. It has provided over 50 percent of total ODA to Fiji between 2006 and 2013 (making it the largest donor), and close to 30 percent of ODA in Cook Islands, Samoa, Tonga and Vanuatu, where it has become the second main source of development funding. Much of this (approximately 80 percent) takes the form of concessional loans. Firstly, foreign aid to the region is not going away, nor is it becoming less important. Since the turn of the century, foreign aid as a percentage of gross national income has increased in almost half of all Pacific island economies – significantly so, in the case of Tuvalu, Kiribati and Solomon Islands. It has declined significantly in the case of the resource-rich economies of PNG and Timor-Leste (see our paper for data). Secondly, aid to the region has increased over the period – in line with the international scale-up in foreign aid – but not to the extent it has in other regions, or in developing countries as a whole. A third point to note is that foreign aid is distributed very unequally in the Pacific, with per capita aid to the poorest countries often quite limited. This is troubling from a poverty alleviation perspective. Lastly, our analysis shows that while China has become an important donor, it is far from the dominant player in the region – despite alarmist reporting to that effect.